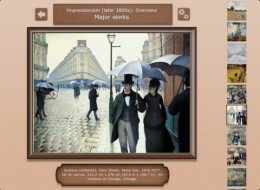 Art Authority for iPad is a glorified new media encyclopedia of some of the finest works of art in the world. 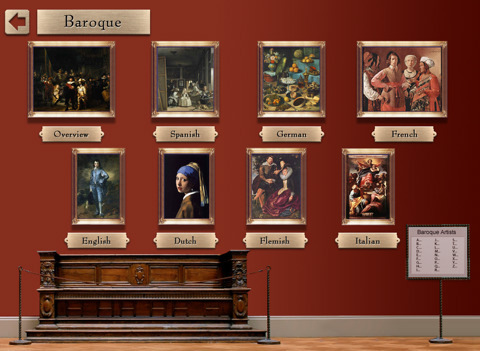 The app’s 40,000 piece collection gives users iPad access to more than 1,000 artists from Ancient times to Contemporary periods, delivering the whole package in an experience that simulates museum going minus the legwork. The app starts with a wall of art meant to divide the art into categories based on time periods and then delivers a getting around map along with an artist directory (displayed as floor plans in the lower right hand corner). If you want you can start by reading the Getting Around tutorials about navigation, how the museum works, and more, but unless you want to read iPhone optimized verbal instructions, it’s better to just dive straight into the actual collections based on artist name or time period. To get into a room you click on the wall art. Regardless of which room you choose, you’ll find an overview along with a few extra categories (e.g. German and American or a list of centuries). There’s also a sign that lets you search each room based on artist for quick access. When you click on a wall paneled category you’re given a drop drown down menu to scroll through. When you pick an artist their work shows up in a mounted and annotated wall view with thumbnails of other existing pieces on the right. To zoom into pictures and see them full size, you click on the picture. From there you can scroll through works, press the “i” button for a Wikipedia link to information about the artist, or just click on the back buttons until you return to the room or complete museum view complete with a bench, hardwood floors and more. Sometimes there’s even a rose on the floor for added effect, though I couldn’t explain why. Clearly, the best aspect of Art Authority is the sheer volume of the artworks contained in the database. The team at Open Door has done an excellent job of getting a hold of one of the greatest archives of works available on the iPad. If anything I would say that this app is an invaluable resource for anyone studying art history. It’s an on demand in app that downloads what you access when you click on it, and then lets you save works to your photo library for future reference. 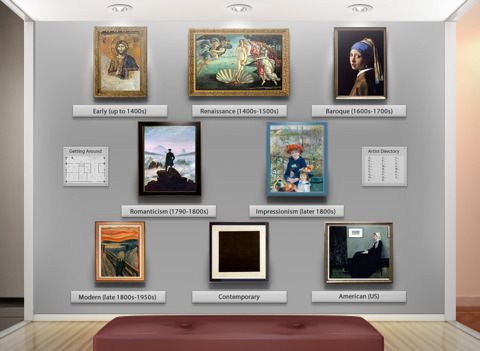 Most of the works are high resolution (apparently copyright prevents the app from collecting high resolution versions of more modern pieces), and you can zoom or see the art either full screen, against the wall, or in a black contrasting backdrop if the dimensions prevent the work from fitting optimally on the screen. For everything that the developers have done with this app, I imagine we’re not far off from an even more powerful version of both this apps and reference apps in general. For starters, the navigation of Art Authority is laid out more like a web browser than an intuitive, gesture savvy iPad experience. Since everyone is used to finding back buttons this is just a small point of contention. It’s certainly no reason not to buy this vast resource. It’s a great app to get lost in, and that’s sort of what you have to do to totally enjoy its resources. Perhaps in the future, instead of educating us on the background of art with minimal placards, static timelines, and a tab that says “Major Works,” we’ll find ourselves immersed in a world where entering a room gives you the option to watch art history videos and even interact with the app by answering questions and passing quizzes. For now Art Authority is a wonderfully vast visual encyclopedia with VIP feeling access to the best art in history. Bottom Line: Art Authority is an app based art experience with more than 40,000 works in its arsenal. Its meant to deliver a museum experience to the iPad, and serves as a healthy reference for important art.